Description: A small wallet that is extremely convenient; it has a closed size 8 x 10.5 cm and an open size of 8 x 22 cm. It can slide in the hip pocket or the shirt pocket. It has a pocket in the front with a design showing the opening. 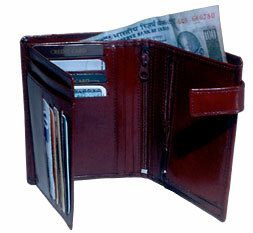 It has a single compartment for currency notes and a zip pocket for coins. 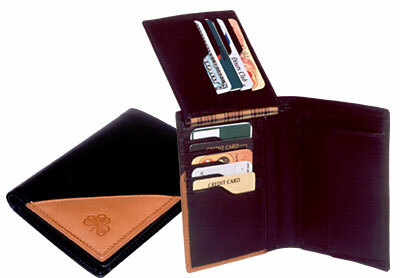 It has a two side flap system that accommodated six credit cards and two net pockets. The model can be made in different types of leathers like Cow Polished, Cow Nappa, Cow Vegetable, Buff Resin, Buff Glazed, Buff Vegetable and Cow Softy. The colours available are black, blue, brown and shades of cognac and burgundy. Description: A briefcase designed leather wallet. 28.5 x 22.5 cm is the open size. The centre has a pen hold. This wallet has eight credit card pockets. There is a small coin pocket on the LHS. There is a zip pocket of size 12 x 22.5 cm on the LHS. There are two net pockets and beneath are two more pockets. The model can be made in different types of leathers like Cow Polished, Cow Nappa, Cow Vegetable, Buff Resin, Buff Glazed, Buff Vegetable and Cow Softy. The colours available are black, blue, brown and shades of cognac and burgundy. 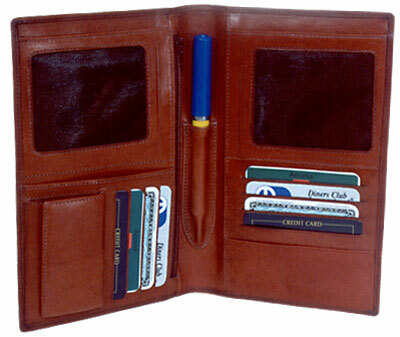 Description: A leather wallet of closed size 8 x 10.5 cm or open size of 8 X 22 cm. A small wallet that is extremely convenient. It can slide in the hip pocket of the shirt pocket. It has a pocket in the front with a design showing the opening. It has a single compartment for currency notes and a press button pocket for coins. 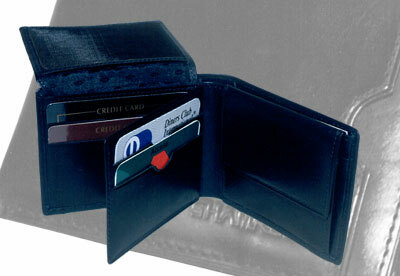 It has a two side flap system that accommodated six credit cards and two net pockets. The model can be made in different types of leathers like Cow Polished, Cow Nappa, Cow Vegetable, Buff Resin, Buff Glazed, Buff Vegetable and Cow Softy. The colours available are black, blue, brown and shades of cognac and burgundy. Description: A well crafted leather wallet for the inside pocket of the blazer or jacket. The open size is 17 x 21.5 cm. There are two side pockets for currency. The RHS has a zip pocket for coins and a transparent pocket for keeping a card with your name & address and a pocket for stamps. The LHS has a net window for the driving license. Beneath the net window are 6 credit card slots and two side pockets. Behind the net window are five more credit card slots and two side pockets. In the front you can see the embossing which has been done by an additional piece of leather coming from underneath. The model can be made in different types of leathers like Cow Polished, Cow Nappa, Cow Vegetable, Buff Resin, Buff Glazed, Buff Vegetable and Cow Softy. The colours available are black, blue, brown and shades of cognac and burgundy. This wallet opens as a tri-fold wallet. There are 6 credit card slots, five side pockets, a coin pocket in the middle and a zip pocket in the middle that runs the length of the wallet. There are two note compartments. 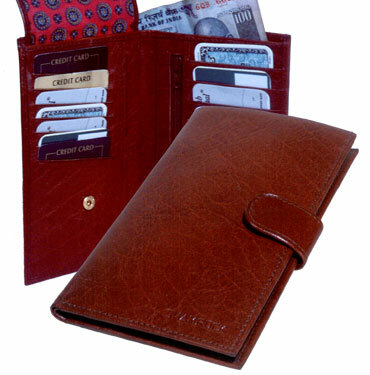 This leather wallet or men�s billfold is shut by a press button of the tab and dome system. At the back is a flap shut by a press button, a pocket for coins of size 13 x 9.5 cm. It has one note compartment, five credit card slots, a net window for a card, two side pockets on the RHS and 2 side pockets on LHS. Beneath the LHS credit card section are two net windows. Description: This Note Case is crafted out of beautiful Cow and Buff leathers with a triangular combination of a leather strip. The open size is 13.5 x 20.5 cm. It has two deep note compartments, nine card slots with the slots having a design, three side pockets and a mesh window for the driving license. 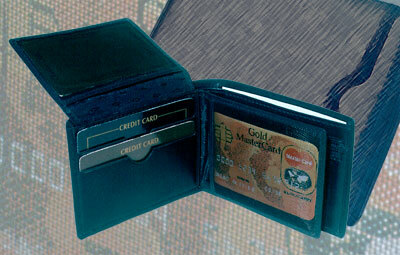 Behind the mesh pocket is another pocket for cards or credit card slips. Coins can be kept in the press button pocket on the right hand side. The model can be made in different types of leathers like Cow Polished, Cow Nappa, Cow Vegetable, Buff Resin, Buff Glazed, Buff Vegetable and Cow Softy. The colours available are black, blue, brown and shades of cognac and burgundy. 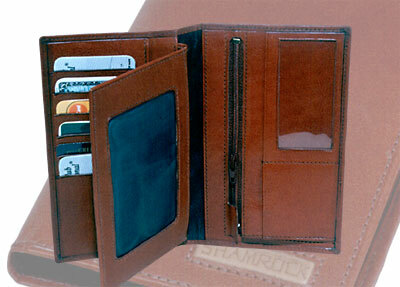 Description: A leather billfold or wallet of open size 25.5 x 10 cm. It has two compartments for bills or notes and press button coin pocket. There are five credit card slots and a side pocket. Behind the flap on the LHS is a new pocket for the driver�s license. The model can be made in different types of leathers like Cow Polished, Cow Nappa, Cow Vegetable, Buff Resin, Buff Glazed, Buff Vegetable and Cow Softy. The colours available are black, blue, brown and shades of cognac and burgundy. Description: A wallet for the jacket or blazer crafted from the finest buff leather. It has an open size of 21 x 16.5 cm. 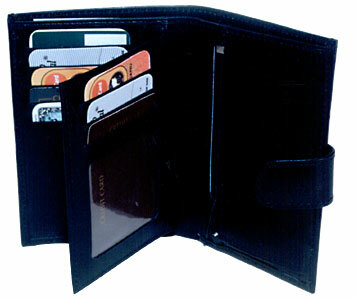 The wallet is shut by the tab and dome system. It has one deep note compartment. On the RHS are 6 credit card slots, two side pockets and a zip pocket for some coins. The LHS has a flap shut with a press button. On the top is a transparent window for the driving license and behind is another window for photographs. On lifting the flap there are 10 credit card slots and two side pockets. Altogether, the wallet has 16 credit cards. The model can be made in different types of leathers like Cow Polished, Cow Nappa, Cow Vegetable, Buff Resin, Buff Glazed, Buff Vegetable and Cow Softy. The colours available are black, blue, brown and shades of cognac and burgundy. A gent�s leather notecase or wallet with two pockets for currency notes and a zip in the middle that runs the full length of the wallet. The RHS has a press button flap pocket for coins. There are side pockets on each side. 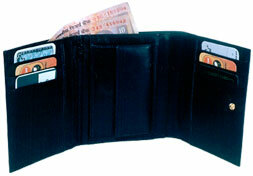 The LHS flap on top has two credit card slots and a net window for the new credit card driving license. Behind the flap is a net pocket for photographs. On lifting the flap there are 4 credit card slots and a pocket opening from the top. 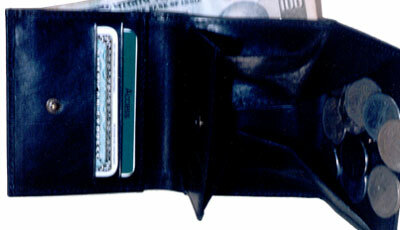 A wallet or billfold shut with a loop and press button on the top end of the wallet. It has two compartments for paper currency and a zip pocket for coins. There is a zip in the middle that provides a pocket that runs the length of the wallet. There is a side pocket on each side. 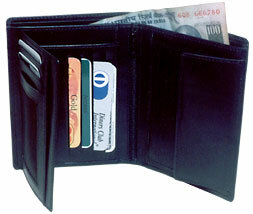 On the LHS one can see four credit card slots and two pockets of size 9 x 12.5 cm & 9 x 11.5 cm. Under the LHS flap, there are four credit card slots and a net window for the driver license or ID card. Description: A cow leather ladies wallet closed by the tab and dome loop. It has an open size of 20 x 13 cm. When open, one can see the zip pocket for coins on the RHS and the LHS flap has 2 credit card slots. There are also 2 side pockets. On lifting the LHS flap you can see 8 credit card slots and two side pockets. The model can be made in different types of leathers like Cow Polished, Cow Nappa, Cow Vegetable, Buff Resin, Buff Glazed, Buff Vegetable and Cow Softy. The colours available are black, blue, brown and shades of cognac and burgundy. 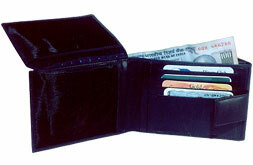 Description: A leather wallet with tray purse for coins. The open size of the model is 10 x 17.5 cm. There is only a single compartment for currency notes. The LHS has 2 credit card slots and a side pocket. The RHS has the tray coin purse. The model can be made in different types of leathers like Cow Polished, Cow Nappa, Cow Vegetable, Buff Resin, Buff Glazed, Buff Vegetable and Cow Softy. The colours available are black, blue, brown and shades of cognac and burgundy.